The DB Sports Summer Cup is back again this August Bank holiday weekend. 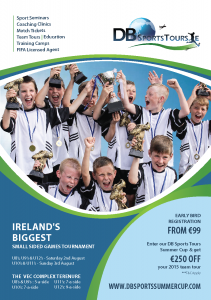 This years event will see over 100 teams compete over 5 age groups U8’s – U12’s in the VEC Complex Terenure. Due to popular demand we have now added a new U8’s (5-a-side) section. The U8′s will compete on the same day as the U9’s (5-a-side) and U12’s (9a-side) on Saturday August 2nd while the U10’s & U11’s (7a-side) will play on Sunday August 3rd.